Once Star Home Call Lite App is installed onto smart phone, users can make high-quality voice and video calls to other users of the same app using Wi-Fi or mobile data. 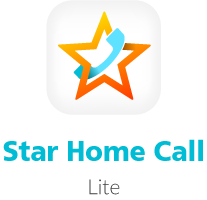 Please click here for the terms and conditions of “Star Home Call Lite” service. Designated HKT residential telephone line and eye service customers can upgrade the service to Star Home Call Pro Service for free and enjoy Home Link function via linking their mobile app to home phone or eye device. Please click here for the terms and conditions of “Star Home Call Pro” service. ® Hong Kong Telecommunications (HKT) Limited 2019 All Rights Reserved..